Welcome to Kilwins Las Olas! Check out the tour of our store. Welcome to Sunny Fort Lauderdale, known as the “Venice of America” for the canals that frame our beautiful city. Located between the beautiful beaches and America’s most unique wetlands, the Everglades, and in the heart of the historic downtown shopping district that lines the famous Las Olas Blvd, Kilwins has been serving the best Original Recipe ice cream and confections you’ll ever enjoy since opening its doors in 1995. Over the last 16 years, Kilwins has come to be known to both tourists and locals alike as the premiere location to enjoy delicious hand crafted chocolates and hand paddled Mackinac Island fudge as well as the best Kilwins Original Recipe ice cream, making Kilwins a “Can’t Miss” on your next visit to Fort Lauderdale! Even before you step inside to be greeted by our friendly staff, the wafting aroma of fresh, hand rolled waffle cones will pull you back to a time when customer service meant going the extra mile to make each customer feel special. With an assortment of over a hundred different confections, both old fashioned and newly invented, to choose from, Kilwins is a unique blend of old school charm and customer service with modern sensibilities. We hand make all of our chocolates and treats, and any time of day, you can drop by and watch one of our chocolatiers or master fudge makers whip up a wide selection of different confections. From classics such as pretzels and marshmallows to the exotic, like Twinkies and sliced oranges, our chocolatiers work during the day to coat everything you could possibly imagine in our rich milk, dark and white chocolate. If you are lucky, you may even be able to see us hand dip our Perfect apples in our home made copper kettle caramel, the recipe for which has remained unchanged over the last half century. Once the sun goes down, the real show begins, as our fudge and brittle masters take over in the kitchen. Viewing space in the front window is at a premium as people crowd around to watch as our home made Mackinac Island fudge is poured onto a marble slab and paddled by hand. While the rich scent of chocolate washes over the crowd, they marvel as our homemade peanut brittle and caramel corn are laid out on marble slabs before being hand packaged. A lucky few might even manage to get a sample right off the table! All this happens in what is a typical day at Fort Lauderdale’s best sweets stop. Rated by Trip Advisor as not to miss in Fort Lauderdale, send your experience to Trip Advisor. Kilwins Las Olas offers several in store specials, the most popular of which is our fudge special. If you purchase two slices of our award winning Mackinac Island fudge, you get a third for free, and since it doesn’t melt and stays fresh for over a week, it makes an excellent gift to take home, or to take with you on the road. We also offer membership in our Ice Cream Club or Caramel Apple Club. After ordering a scoop of our rich, delicious Kilwins Original Recipe ice cream or a delectable Perfect Caramel Apple, we offer a punch card that, while only good at our particular location, never expires. Bring the card with you each time you return and after having the card punched 12 times; we then treat you to scoop of ice cream or caramel apple on the house! Want to join our exclusive discount club? Email us at lasolas@kilwins.com and include your name, address and Birth date and we will get you free Original Recipe Free Ice Cream on your Birthday!!! For those times when you just have to have the best for an event, Kilwins Las Olas offers a catering service, where we bring the best ice cream to you! Choose 6 flavors from our wide selection and we will bring our ice cream cart to your event. We cater any event: weddings, birthday parties, and religious celebrations, corporate and scholastic functions. In addition our Original Recipe ice cream we also bring with us a toppings bar and waffle station so you can have the full Kilwins experience at your next event! If the full Ice Cream Social would be a bit too much, but you would still like to enjoy Kilwin’s Ice Cream, we also offer an ice cream server. Choose a single flavor of our ice cream and we will supply a specially designed server to keep the ice cream cold as well as all the spoons, cups, napkins and scoops you need to make your function a hit! If ice cream isn’t what you have in mind, we here at Kilwins Las Olas can also cater your event with a variety of custom made chocolate treats. We take our own creations, such as Turtle Puffs, Caramel Smores, Nutterbutters, chocolate pretzels, etc, and scale them down to bite size pieces for your guests to enjoy. A perfect ending to a fabulous dinner or birthday party, our chocolatiers will work with you to create a custom platter of any treat we offer in the store. 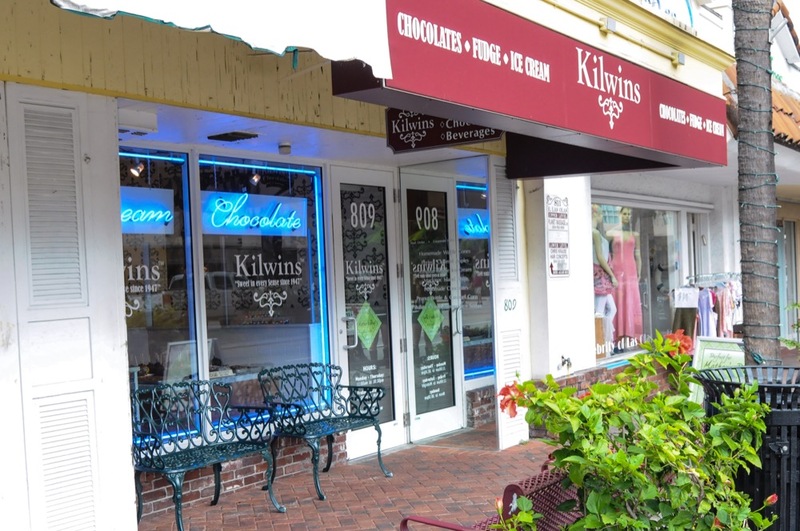 If you would like to bring a group to see the inner workings of Kilwins Las Olas, we also offer field trips for groups of 12 to 25. Starting in the morning, before business hours, we bring your group into the store and give a brief lecture on the history of chocolate, methods of chocolate production, and a chocolate tasting session. We then invite the group to make some of their own confections, which can be taken home, and then invite the participants to make any purchases they would like at a discount. Designed for all ages, from senior groups looking for a unique experience, to school children looking for a delicious field trip, the Kilwin’s Experience is not to be missed!